We recently built a garage with an upstairs apartment using a septic system. 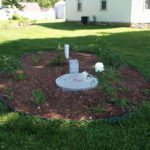 What perennial can we plant that is deer tolerant and septic system approved? We are looking for a ground cover that will be in partial sun/shade throughout the day. It will be important for me to know your climate zone. This will help me to recommend plants that will be suitable for your area.